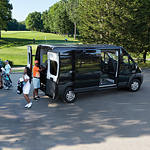 The Ram ProMaster is a popular cargo van and passenger wagon with consumers here at Lithia Chrysler Jeep Dodge of Tri-Cities because it was engineered to offer a number of features that enhance durability. Ram stands behind the durability of this cargo van and offers a 3-year/36,000-mile basic limited warranty and a 5-year/60,000-mile gas powertrain warranty. The ProMaster is equipped with a three-piece modular front fascia and rear fascia that are made with sturdy thermoplastic composite panels that can be removed and serviced with ease. The headlights and taillights are positioned strategically away from common impact zones, and the side panels of the van are mounted in a low position to protect it from dents. Electronic Stability Control (ESC) is included with the ProMaster. This feature comes with All-Speed Traction and Trailer Sway Control for advanced stability, and ESC can help drivers maintain direction control during adverse driving situations by engaging the brakes when needed.